C. R. Sail : Waikiki and Hilo, 1892. 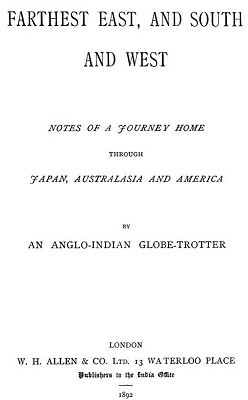 Farthest East South And West Notes Of A Journey Home Through Japan Australasia And America. W. H. Allen & Co Ltd., London, 1892. Sail bathes at Waikiki and is later dissapointed not to see the famed surfboard riders at Hilo, there being no suitable swell. (I fetched the Japanese bathing-woman completely by talking to her in her own language. By the way, how terrible a Japanese woman looks in a " holoku." great bare dead giant that shuts in the bay on the East. Yet, at length we reach Hilo, famed for its beauty ; but to-day it is all veiled in grey mist and drifting cloud-wrack. myself back in some little town on the Tenasserim Coast. We were very eager to see the " surf-riding " of the Hiloan bathers — a most graceful and skilful sport, they say ; but there was not surf enough, and we could not. (Yet, how that ship did roll ! Through Japan Australasia And America. Geoff Cater (2012) : C. R. Sail : Waikiki and Hilo, 1892.